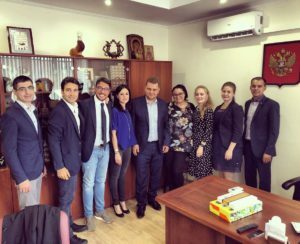 On July 24, a meeting of Russian youth organizations’ representatives with the leadership of the National Youth Forum of Italy (Forum Nazionale dei Giovani) was held on the basis of the Russian Technological University (MIREA). The Russian side was represented by the Chairperson of the National Youth Council of Russia Grigory Petushkov, the Coordinator of the NYCR international programs Valeria Dubravina and the Press Secretary of the NYCR Elena Marchan, the Head of the RURY (Russian Union of Rural Youth) Educational Center Sergei Martirosovich and the Chairperson of the German Youth Association (Jugendring der Russlanddeutschen) Eugene Wagner. The Italian delegation included the Chairperson of the National Youth Forum of Italy Maria Cristina Rosaria Pisani, member of the Board of the National Youth Forum of Italy Mario Pozzi, member of the Board of the National Youth Forum of Italy Federica Celestini Campanari, Coordinator for Communications of the National Youth Forum of Italy Giampiero Marazzo. During the conversation, the prospects of interaction between the two organizations, the relevance and importance of maintaining a dialogue between the youth of Russia and Italy, and the intensification of contacts, including high level ones, were discussed.